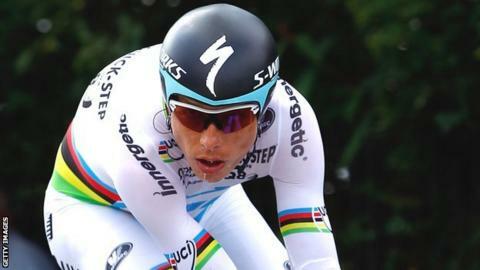 Time trial world champion Tony Martin, one of Bradley Wiggins' main rivals for Olympic gold, has pulled out of the Tour de France in order to let a broken wrist heal in time for London 2012. The German, 27, suffered the fracture in a crash on the first stage of the Tour but rode on with a special cast. "It's difficult for me to step out of the Tour and leave my team-mates here to keep on fighting," the Omega Pharma Quick Step rider said in a statement. "But it's the right thing to do now." Martin added: "I have still three weeks before the Olympics. I know that it won't be easy, but I will do all my best to be in good shape." Martin will be looking to add the Olympic time trial title to the one he claimed at the 2011 Road World Championships in Copenhagen, when he finished a place ahead of Briton Wiggins. The two will go head to head again at the London 2012 road time trial, which is on 1 August. Three-time Olympic gold medallist Wiggins currently leads the Tour and is aiming to become the first Briton to win the famous race.